Its first chairman was Andreas Hermes, who had been a prominent member of the Centre Party during the Weimar Republic and a three-time minister. He fled to the West in 1946 and was replaced by Jakob Kaiser, another former Centre Party member. Kaiser had been a prominent member of the Centre's left wing, and favoured nationalisation of heavy industries and a land distribution program suggested by the Communists. However, his criticism of the Communists resulted in him being pushed out in 1947 in favour of the more pliant Otto Nuschke, a former member of the German Democratic Party. Nuschke and his supporters gradually pushed out those CDU members who were not willing to do the Communists' bidding. This culminated at the Sixth Party Congress in 1952, at which it formally transformed itself into a loyal partner of the Communists. At this gathering, it declared itself "a Socialist party without any limitations" in accordance with the new line of "Christian realism." 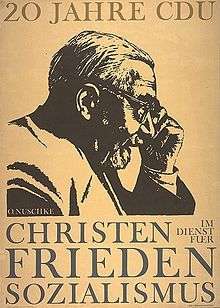 In the 22 "Theses on Christian Realism", the CDU committed itself to the "Socialist reorganisation of Society" (1. edition, 1951). Emphasising the "exemplary realisation" of Karl Marx's "teaching on building a new, better social order" in the USSR, it was declared that Socialism offered at the time "the best opportunity for the realisation of Christ's demands and for exercising the practical Christianity." The programme also asserted the CDU's support for the working class' leading role in establishing socialism, a development which the party regarded from its 6th Congress on as "historically necessary and consistent." 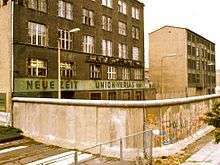 Its deputies, like all other East German parties, consistently voted for the government proposals in the Volkskammer, The only exception was the March 9, 1972 vote on the abortion law, when there were 14 'nays' and 8 absentees among the CDU deputies. After Nuschke's death, August Bach, another former DDP member, led the party for the remainder of the 1950s. In 1966 longtime general secretary Gerald Götting was elected chairman. Götting, who was chairman of the Volkskammer (and de facto vice president of the GDR) from 1969 to 1976, carried on and elaborated the pro-government line. Götting remained chairman and an SED ally until Erich Honecker was deposed in favour of Egon Krenz in October 1989. On 2 November 1989, Götting was deposed by inner party reformers. In December 1989 Lothar de Maizière, a lawyer and deputy chairman of the Evangelical Church Synod of East Germany, was elected chairman. From that point on the party deposed (and later expelled) its former top figures, and became the strongest proponent of speedy reunification with West Germany. In March 1990, the CDU became the main element of the Alliance for Germany, a centre-right coalition. It won the first (and as it turned out, only) free general elections and became the biggest party in the People's Chamber. In April de Maizìere became Prime Minister of the GDR, heading a grand coalition that immediately set about reuniting the country with the West. The CDU maintained close relations with other Christian democratic parties in the Soviet block. Relations with the progressive Catholic PAX Association in Poland and the Czechoslovak People's Party (CSL) where especially close. There were some contacts with individual members of Christian Democracy (Italy) (DC), the Belgium Christian People's Party (CVP) and the Christian Social Party (PSC) and the Dutch Christian Democratic Appeal (CDA). 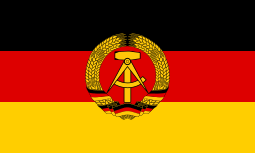 Despite the fact that the East German CDU and its West German counterpart were often at odds with each other, they maintained official relations. ↑ Proposed by Jakob Kaiser, Ernst Lemmer etc. It's considered a blending of Catholic social teachings and some social democratic and social liberal ideas.